We offer a variety of lessons for both children and adults from beginners to advanced (pony club level for youths). Community horse riding takes place Monday to Friday each week between 5.00 – 8.00 pm and Saturday 9.00 – 4.00pm. Children must be 6 years of age to participate. 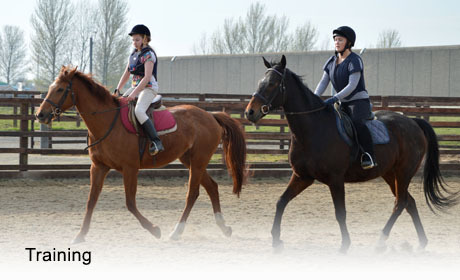 We operate a graded riding system so that riders are among pupils of the same level. This is to provide progression and learning opportunities for members of the community who avail of the community horse riding lessons. Adult lessons take place twice weekly and more details are available upon request. Coffee evenings take place at the end of each term and pupils receive a certificate for each grade that they have completed. It usually takes 10 weeks to complete on grade however it is not unusual for younger children to stay for 2 terms in the one grade. Stable Management is available to any person wanting to develop and enhance their equine knowledge. 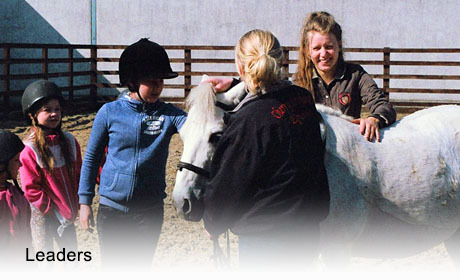 All of our instructors are British Horse Society (BHS) qualified and have child protection and first aid certification. Please note that on completion of your first lesson we will advise the most appropiate lesson to suit your standard. Pony camps are run during school mid-term breaks throughout the year. These generally run from Monday – Thursday 10.00 – 12.00 pm and 2.00 pm -4.00 pm. The camps involve horse riding, care for the animals, stable management, grooming and a range of games and other activities. The camps are very popular and have proven to be a great way to make friends – early booking is advisable and a deposit is necessary to secure your place. We operate a number of weekly slots for children and adults with special needs. We provide allocated classes each week, these lessons help with balance, co-ordination, communication, physical fitness, mobility and of course the connection and bond that is created when around these beautiful majestic animals. For more details, contact reception on 01 6209160. • Correct footwear and head gear must be worn. • We provide boots and hats, but it is advisable to purchase your own if taking up riding. • We strongly advise that full personal accident insurance is taken out. • Horse riding is a dangerous sport, whilst the management endeavors to use correct procedures at all times to ensure the safety of each participant, we do not take responsibility for any accident / injury that may be occurred from equine activities. • Smoking is to be kept in the designated area. • It is advised to arrive ten minutes before scheduled riding lesson in order to get correct footwear and headgear. Here are our beloved horses and ponies who make it all happen. 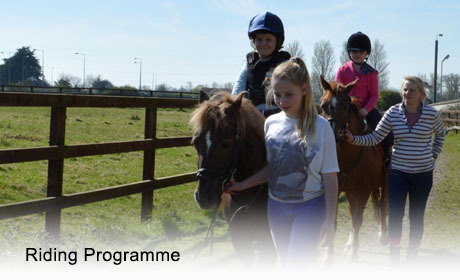 We operate a range of group programmes which are primarily targeted at schools, youth services, special needs groups, recreation and sports groups and clubs, Garda Youth Diversion Projects and any other groups that wish to take part in horse riding / welfare programmes. 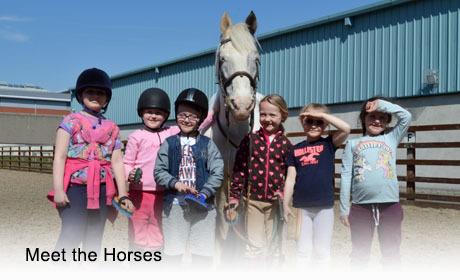 The group programmes generally involves children/teenagers taking part in riding lessons and other tasks and activities including mucking out, grooming, and care and mangement of horses and ponies. This program helps young people to develop a better understanding of animals and improve their confidence around animals. It also greatly aids the development of learning and social skills. The programmes are generally one or two hour programmes.These group programmes have proven highly successful and we have many repeat visitors. Cherry Orchard Equine Centre Ltd.